This is a curious item. 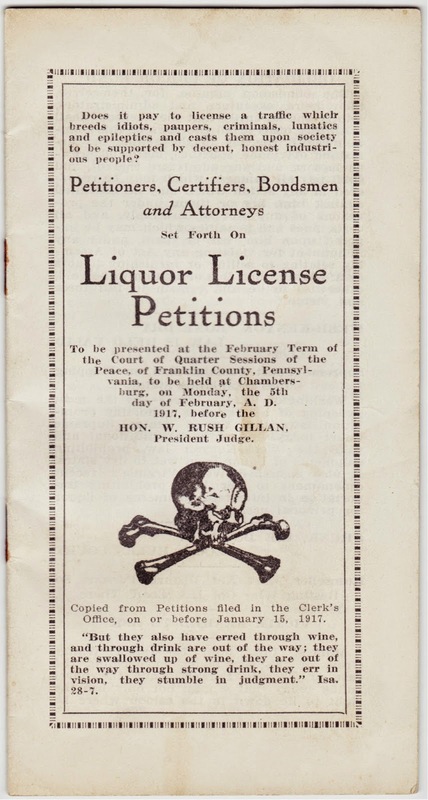 It's a staplebound pamphlet — presumably produced by a temperance or prohibitionist group — naming the individuals associated with every liquor license petition that had been put forth for approval in Franklin County, Pennsylvania, in February 1917. 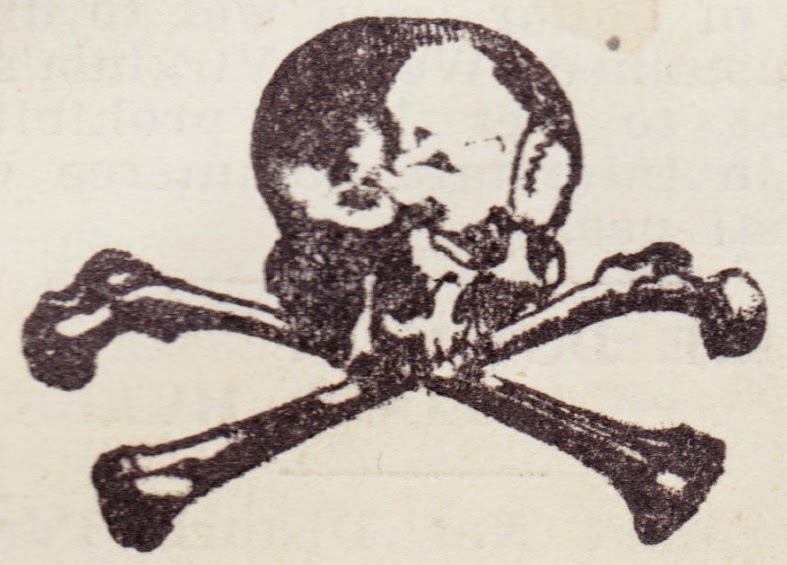 As you might tell from the skull and crossbones on the front, the makers of the this pamphlet did not have a high opinion of those involved with the petitions. The pamphlet served as a means to publicly "out" them and perhaps even shame them into disassociating themselves from the business of bottling, serving and selling alcohol. In addition to the list of all the petitioners (including certifiers, bondsmen and attorneys), the booklet is filled with anti-drinking evangelism, mostly in the form of Bible passages. "Does it pay to license a traffic which breeds idiots, paupers, criminals, lunatics and epileptics and casts them upon society to be supported by decent, honest industrious people?" Indeed, there were no shades of gray for these folks. Many names of signers crop up on multiple petitions, a fact noted within the pages of the pamphlet: "Of the 3000 taxpayers, 160 names include all the signers of the Chambersburg petitions, some names having appeared six and seven times. 'Shall we sit idle while Satan works?'" In addition, some attorneys are associated with multiple petitions; the name Garnet Gehr pops up the most often. "Kansas has the lowest death rate in the world. The lowest percentage of illiteracy in the United States, largely as a result of its 30 years of prohibition." "Of the 1000 men in our Eastern Penitentiary, 899 gave liquor as the direct cause of their downfall." "The most dangerous classes of ruffians in our cities are beer drinkers." We know who got the last laugh. Two years after the publication of this pamphlet, the Eighteenth Amendment was ratified (in January 1919), and the U.S. prohibition officially began in January 1920.